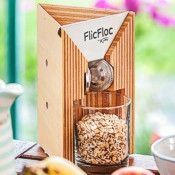 Mother's Day Special: Receive the NutriMill Mini Seed Mill and Home-Ground Flour book FREE with the NutriMill Plus grain mill! Introducing the NEW NutriMill Plus! The new NutriMill Plus grain mill boasts 11 new patented improvements. It’s 15% quieter than L'Equip's previous design, and has 20% more batch capacity—now a huge 24 cups! With all these advancements, the NutriMill Plus retains all the key advantages of the very popular NutriMill Classic, starting with the ability to grind flour from fine to coarse, or anywhere between. 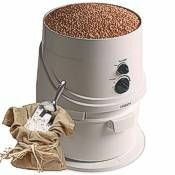 The NutriMill Plus electric grain mill uses a high speed impact milling chamber (also referred to as a micronizer) to create flour from grains and beans, a modern and well-proven milling design. 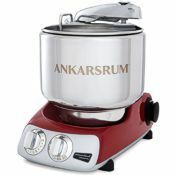 Convenient, powerful & fast: Just pour grain in the hopper, turn the NutriMill on, and its powerful two speed, 1200 watt motor does the rest to quickly produce your choice of fine, medium or coarse flour. 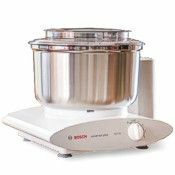 The grinding mechanism is self cleaning, and with a new four stage filtration system it operates exceptionally dust-free. The versatile NutriMill Plus grinds wheat (both hard and soft), oat groats (dehulled oats), spelt, kamut, triticale, rice, dry beans, lentils, dent (field) corn, popcorn, dried sweet corn, split peas, buckwheat, rye, barley, millet, quinoa, amaranth, teff, sorghum, dried mung beans and soybeans. It will also grind dried just-sprouted grain. The NutriMill Plus isn't suitable for spices, herbs, oilseeds such as flax, chopped chestnuts, flaked oats or fibrous materials. Grains and beans that have already been milled can't be milled again in any impact mill, including the NutriMill Plus. Also note that when set for coarser meal texture, the NutriMill Plus output remains too fine for making cereal grinds such as cream of wheat. 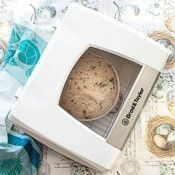 The NutriMill Plus is an outstanding machine for making a full range of flour and meal textures. The design of the NutriMill Plus impact chamber lets you to put grain into the hopper before you turn it on with no risk of plugging the mill, which can happen with older designs. 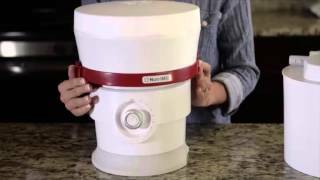 Even if stopped during grinding, the NutriMill Plus restarts again without trouble. 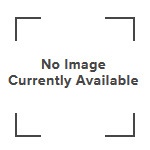 This is a crucial design feature for an impact mill. Protects nutrients: The NutriMill Plus keeps your flour at temperatures (typically about 118°) that protect the nutrients in your grains. Its new airflow design makes the NutriMill the world's coolest-running impact mill. The NutriMill Plus includes flour bagger that makes it easy to prepare flour ahead, and it's ideal for making a gift of flour to a friend. A ring holds the bag in place in the flour bin, and one bag holds all the flour from a full hopper of grain. Ten plastic storage bags are included with the grain mill. Our customers love their NutriMills! 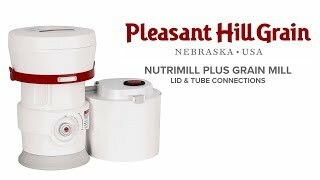 Pleasant Hill Grain has been the world's largest retailer of the NutriMill line of grain mills for more than a decade. Our experience spans the milling spectrum from home-use to commercial. We're here as your resource before and after the sale, and we'd be delighted to visit with you about a NutriMill Plus or any aspect of your milling needs. We'd appreciate your business, and we look forward to serving you in any way we can! 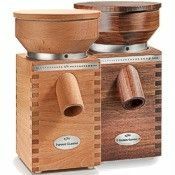 The NutriMill Classic grain mill will continue to be available, in addition to the new Plus model. 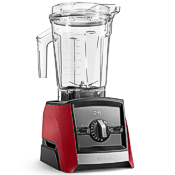 The Classic model is still an outstanding choice, and you can see the NutriMill Classic here. 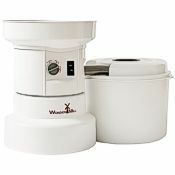 Click here to see how the NutriMill Plus flour canister connects to the grain mill. I use the mill every week to grind grains for the 4-5 loaves of bread I bake. I also do other baking like cakes, pies, crackers and cookies. One time I used flour from the store and my son said the bread tasted old. I had sent my mill in for repair. Fresh ground flour makes a big difference in how your product tastes! I also grind popcorn for my waffle recipe or when making corn bread. Sometimes I make gluten free bread and crackers so other items get ground also besides the wheat, barley, oats and rye. I love my mill. I never buy flour except for that one time. I have been very happy with every thing I have ground. It is not messy and you don't have flour flying around your kitchen. It grinds quickly and is not nearly as noisy as other mills. It is easy to operate and clean. It stores away compactly. The hopper takes enough grain for the 5 loaves of bread I make. I highly recommend the NutriMill! 64 out of 64 people found this review helpful. Did you? I've been using my Nutrimill for over a decade. We love it! 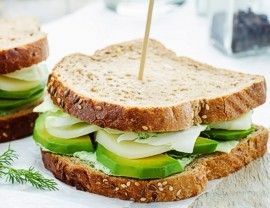 I have never liked the taste of store-bought whole wheat goods because it tastes sour to me. Freshly ground wheat is another matter. 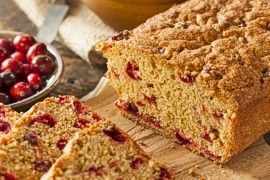 We use it for EVERYTHING - breads, cakes, cookies, you name it. Pleasant Hill Grain has the best customer service ever. They noticed I placed two orders in a row because I had forgotten to add something and called me and combined the orders so I wouldn't have to pay double shipping! It was a weekend so I figured I would just have to lose the money, but they went the extra mile. This was my first time using this mill. The fineness of the flour is just amazing! Hard white wheat was my choice for my first loaf of bread from home ground flour. It raised twice as high as my usual w/w flour does. Even my husband likes it very much. I can see milling your own flour makes a world of difference! Not as noisy as I expected from comments I'd read. Also faster than I thought it would be. A very nice mill so far. Much quieter than the vacuum cleaner, first use had a very minor dust leak at bin lid edge though none after that. Must be a breaking-in thing. It milled my wheat berries unbelieving fast and uniform. I tried all the settings. sifted and got different results of more or less branny stuff in sifter. Just saying that because even though it's a slight turn of the dial, the machine does the thinking. The Nutrimill Plus is fun to us and not messy at all. I'm totally new to milling my own grain and I'm absolutely hooked. The taste of a fresh baked loaf of bread... delicious! Eager to try more grains. Pleasant Hill Grain gave excellent service and free shipping. I'm very happy about the button that enables me to disconnect the motor section from the base part. I need to remove it for the spot I store my mill in, and this makes that possible. The mill is just wonderful. New to fresh-milled flour, and I'm hooked! Very pleasantly surprised at how truly simple and clean this whole process is. Been using the mill for a few months now. 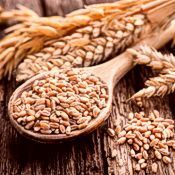 Ordered wheat berries, rye, spelt, barley, millet, etc. Everything mills cleanly and easily. No dust storms! As a bonus, the mill is compact and good-looking, so I don't mind leaving it out on my counter in a corner. Biggest and best surprise of all is how much my kids like the pancakes, biscuits, and bread that we make from fresh-milled grains. Even a roux comes out great with fresh flour. Very happy with this product. 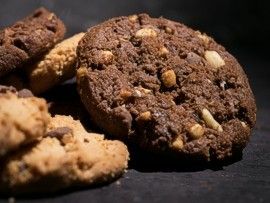 Suggestion: volume measurements (cups, tablespoons) are not as reliable as before because my fresh flour "settles" over time. Bought a kitchen scale and use weight to keep track of my recipes. Makes it more likely to replicate a successful experiment. We really only grind wheat, oats, and barley but with the customization ability of this mill we can figure out how to use other grains and beans. Plus we can choose the grit from very fine to course flour. Seems sturdy. Like all other mills it's loud, but there is no flour flying while grinding and the container for holding the floor is very large. Great product. We received this mill as a gift from parents and it sat in the box in a closet for months. We did not know what we had! When we started baking our own bread regularly (almost 4-1/2 years ago! ), we pulled out our NutriMill. We have put this mill through the wringer using it several times a week grinding anywhere from three to eight cups of grain at a time. We grind wheat, groats, quinoa, beans, and brown rice. We have been thrilled with the flour. The warranty is also great. Our machine stopped working one night (only a buzz) and we were able to send it in and get it fixed for no charge. 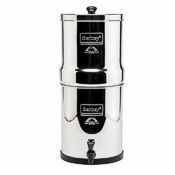 We are happy with our NutriMill and recommend it to anyone looking for a grinder. I don't have a Nutrimill Classic to compare it to, but I DO have a hand-powered mill, and - not surprisingly - the grain is ground far faster this way. I wasn't able to find much flour dust around after grinding, and it's pretty easy to clean. My only complaint is that the grain doesn't always automatically go from the hopper to the grinder. .. I often have to stir it a little bit to get it going again. It's possible that I have the red "thing" that controls the grain set up incorrectly though... if so, I'll come back and edit. I bought this because the wife likes to cook and we like it fresh and somewhat "do it yourself ". This fills the bill. 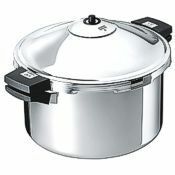 Wife has used it every day for cooking and baking. She really loves it. Bought dark wheat, white and corn in buckets and she's made a good dent in them. Highly recommended.